Liam Teague, head of steelpan studies and an associate professor in the NIU School of Music, has been named the 2014 Laureate in Arts and Letters by the Anthony N Sabga Caribbean Awards For Excellence. Launched in 2005 by the ANSA McAL Foundation, the awards are the English-speaking Caribbean’s leading recognition program in arts, sciences and public and civic work. The goal is to recognize significant Caribbean achievement, to encourage and to support the pursuit of excellence by Caribbean persons, for the benefit of the region. The ANSA McAL Foundation is convinced that talent needs to be sought out, brought to light and encouraged. 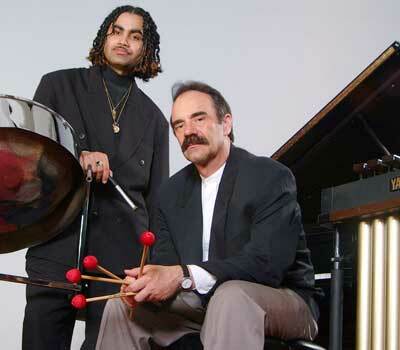 A native of Trinidad, NIU’s Teague is perhaps the most versatile and accomplished pan musician in the world. At the age of 40, the co-director of the legendary NIU Steel Band performs throughout the world, including Trinidad & Tobago, where he returns to arrange for Panorama. From an early age, Teague was recognized as a prodigy, and won several pan competitions in Trinidad. He was a scholarship student at NIU, where he was awarded bachelor’s and master’s degrees in music performance, and where he was a research scholar from 2001-2004. 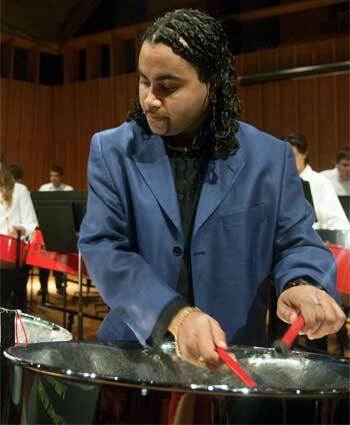 His advocacy of the steelpan is one of the hallmarks of his career. He tirelessly promotes the instrument to international audiences, and has collaborated with several internationally renowned composers whom he has encouraged to compose music for the pan. He maintains a demanding performance schedule worldwide and a close relationship with the University of the West Indies and University of Trinidad and Tobago. As a performer, Teague has performed in the Far East, Australia, Latin America and the United States. Some of the venues and hosts have included the Taiwan National Symphony, the Panama National Symphony, the Birch Creek Music and Performance Center, the Buntrock Hall Symphony Center and the Prague National Symphony Orchestra in the Czech Republic. He also performs in Trinidad. His most recent performance was in January 2013 at Queens Hall and Naparima Bowl. Outside of academia, Teague has recorded eight CDs and has composed several pieces of original music for the pan. “Liam Teague has had significant influence on steelpan performance on an international scale, moving composers to create wonderful compositions for him (and) drawing students from around the world to study with him,” said Paul Bauer, director of the NIU School of Music.